I own a popup camper and while I love the fact that I didn't have to take out a second mortgage to buy it and that it's easy to tow, the limited interior space is a challenge to deal with. To make the most of the space I have available, I use stacking plastic storage drawers for all my non-refrigerated food. Here's a picture of them in use in my popup camper. Everything I need is readily available from canned goods to spices to snacks to potatoes to onions to bananas to cereal and everything else my family needs and wants to eat while we're camping. We even keep our daily vitamins and medications in the top drawer for easy access. Being able to stack the drawers lets me take advantage of the camper's vertical space while fully utilizing the small amount of horizontal space. 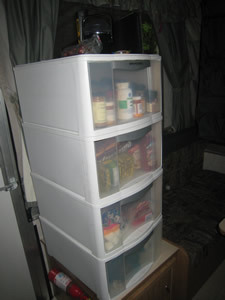 Plastic storage drawers like there are inexpensive, lightweight and easy to clean. When I'm not using them in the camper I store them in my basement. When I'm getting ready for a camping trip, I put the drawers on my kitchen counter and fill them with all my needed items. It works great. The drawers are available at most discount stores. I purchased mine at Target.